The dreaded backup restaurant. You know, the one that you have to settle for because Plan A was an epic fail. It's those types of places where you always keep in your back pocket if nothing else comes to mind. That was the case when the hockey team tried to visit Via Tevere on its opening week. Imagine the hostess' reaction when I requested a table for 12 considering the place was packed. I'm surprised she didn't just laugh at me. Well, maybe she was laughing inside, but she held it together. The chances of us getting a table before they closed was as good as Sean Avery getting a hot blonde girlfriend. Wait... Scratch that. What gives with that anyways? I digress. So we made an executive decision to grab eats somewhere else. 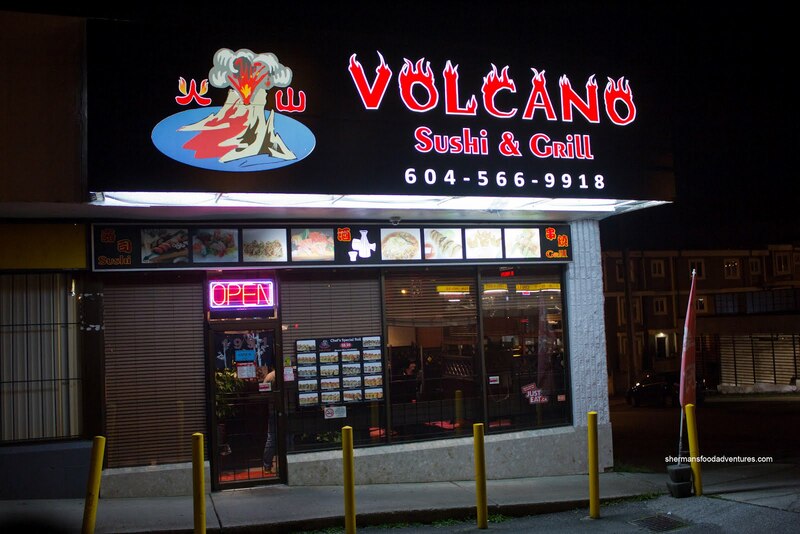 Lionel Hutz chimed in with a nearby place called Volcano Sushi. Yah, most of us were pretty familiar with the place. 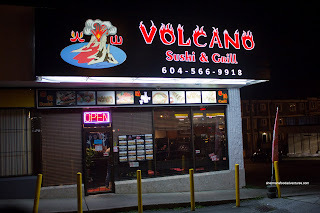 Formerly Wonton Noodles, Volcano Sushi cannot be missed while driving down Hastings due to the flaming awning (no, it's not on fire). Fine, we decided it was close enough and with a bunch of hungry people, we weren't going to be really that choosey. With a brief cameo appearance, Polka King joined us for eats. It probably had a lot to do with Polka Dot's presence (I guess she could keep an eye on him). Along with Gordo and Sweet Tooth, we decided to share some grub. The first item to arrive was the Gyozas. 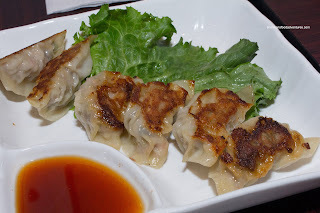 If they called these anything but gyozas, they would have been some really good dumplings. Unlike typical gyozas, the filling consisted of pork, shiitake, cabbage and carrot. Normally, there is only cabbage, pork and onion. With all that being said, the dumplings were fluffy with a moist filling and a thin wrapper. 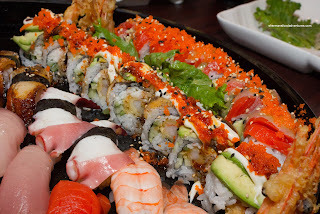 Anyways, for our 2 specialty rolls, we got the Dragon and Vancouver. I would say that both rolls (if ordered a la carte) are not bad for the price ($8.95). Pretty standard stuff really. The rolls were neither offensive nor memorable either. 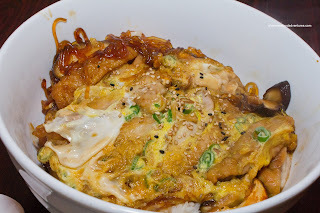 For a filler dish (if we actually needed one), we had the Oyako Don. The rice itself was prepared nicely being chewy with the right amount of moisture. However, everything else was way too salty. The vermicelli was soft and salty while the chicken and egg were salty as well. We could've done without the plethora of fatty chicken skin as well. Lastly, we had the Assorted Tempura which was quite greasy with slightly thick batter. It was okay. 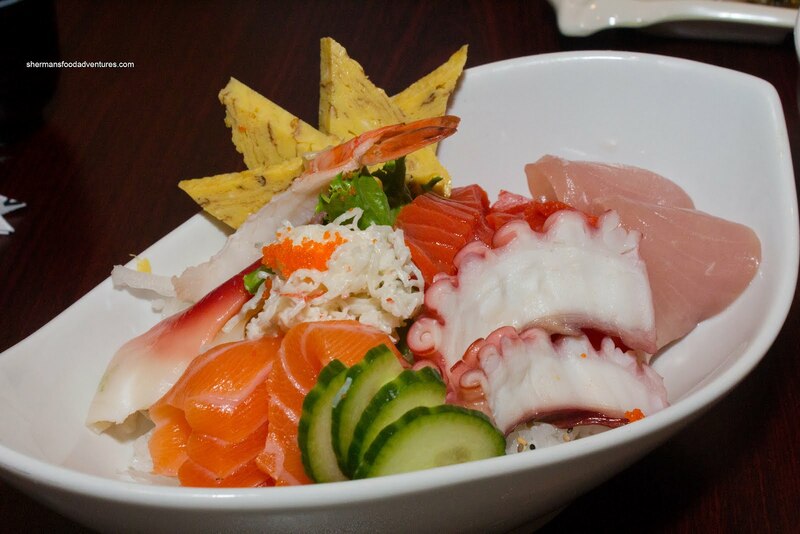 Emilicious had the Chiraishi Don which had a decent assortment of sashimi. Naturally, it was on par with what we had in our platter. She was a bit more sensitive to the vinegary sushi rice than we were. She was pretty indifferent with her food. 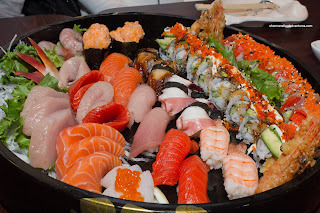 In the end, Volcano Sushi did the job for a reasonable price. 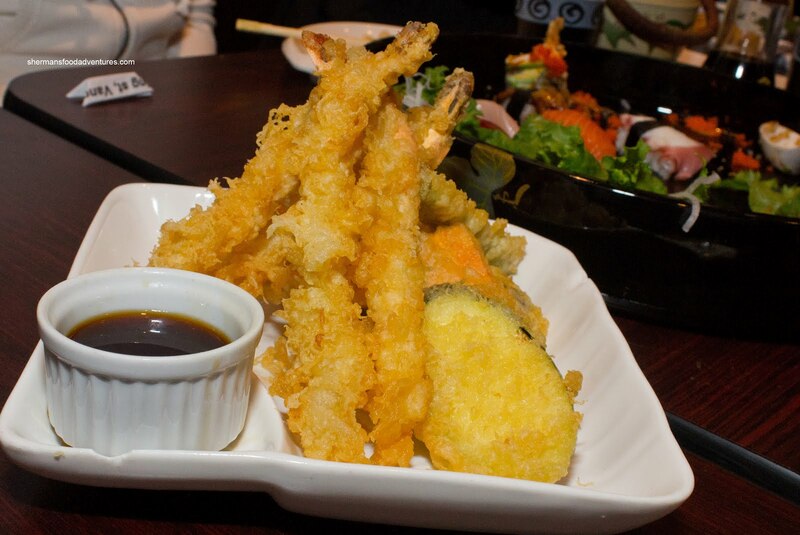 Sure, it ain't great Japanese food, yet it is acceptable. I guess that is all we can hope for in a backup restaurant.